My almost 3 yr old female Aussie, began showing signs of over protectiveness around 18 month and it has gotten worse from there. We worked with a trainer for a full year and have continued to implement the techniques learned working with her but whenever someone enters the house or yard, she goes ballistic. The only exceptions are family and friends she knew well as puppy - other frequent visitors are still treated with aggression and she has snapped at a few people. I have put her on a lead when people enter the house and in the past 9 months err on the side of just putting her in another room which makes me very sad. She is a great, loving, smart girl with her immediate family (myself, husband and 6 yr old son) and I wish she could share this side of herself with others. Part of this issue is now also on our end as we are nervous that she may hurt someone. I also notice she is worse when on a lead BUT I am not comfortable allowing her off of the lead when guests enter. She is fine at the vet and at a dog camp we take her to for socialization and exercise. Any tips you have would be greatly appreciated! I had a large black tri male Aussie for 14 years who exhibited fear aggression when he was a puppy and really never outgrew it. He was extremely loving and dedicated to family and friends he knew as a puppy, but took to very few others after that. I couldn't take him to the dog park because he'd lunge and bark in the face at anyone who looked at him or extended a hand to pet him. It was like it was inborn in him. He'd also do that to people who would come to the house. The only people he didn’t bother were the ones who weren't afraid of him and ignored him. In time he usually accepted them. But anyone trying to be friendly to him first, forget it. He couldn't even go to puppy classes because of his temperament. We finally had to hire a private trainer. This helped a lot and he settled down enough to finally attend classes. Then after he passed away, 4 months later I got another 8 week old male Aussie. I was so relieved to see this dog's temperament was so much different, and thinking he would be easier to manage and not such a liability because he's very socialized, and interacts very positively with all other dogs. But he is an alpha male, the same as my previous dog, except this one was born with confidence and his aggression is more territorial/protective instead of fear aggression. He's 14 months now and his temperament is changing. He started barking at men, especially ones wearing dark clothing. He does not like kids. He'll bark at them and try to nip. In fact, he has lightly nipped a few children. To me that's a warning. I stopped taking him to the dog bark unless no one is there but a few people and dogs, but no kids. He now charges the fence at the dog park, barking at whoever goes by. My oldest son came to visit and the dog tried to nip him and went at his ankles when he came into the house. My son didn't want to be around the dog after that, so the two day visit wasn't very enjoyable. He also kept barking at the bedroom door where my son was staying. This dog seemed "nothing like" my former Aussie, but now he seems to be just like him. I'm trying to figure out why the change. From what I've read on various sites, some dogs do change during their adolescent years and become aggressive, then mellow out after about 20 months. I'm not holding my breath though. Another change in the household is that my husband and I divorced. He moved out a month ago, and comes around a few times a week, but never takes the dog for walks anymore. Then about three weeks ago, I got a 12 month old female Aussie for a playmate. The dogs get along well, but he's very dominant. She can hold her own. He does not have all my attention anymore, and he might feel he has more responsibility as the "protector" now that my husband is no longer living here and there's a new female he must protect. It’s hard to say. I can relate to both of you. Hope everything gets better for you. Please Aussie experts, help us! My Maia also sort of came like this. Fearful. Even as a puppy she wouldn't interact with anyone but us. We've had her since 11 weeks old. She's now just over 18 months. Every time we seem to take 5 steps forward, we then go 10 steps back. I've done everything right - obedience classes, agility classes, private sessions, constant socialization techniques, etc. She's not as bad as some of these stories above, but I feel for you. After 16 months of training, she still seems leery of people and other dogs. Only those whom she has known and accepted since early on are safe, so to speak. To us and them she is loving and trusting. She is very intelligent so at least in not a not so good situation she will leave it or come when told to do so. Okay but blah blah blah aside, what are we doing wrong? And is Prozac the answer? I've learned that Aussies do get more aggressive as they get older, like say beginning around 12-15 months. Typically they calm down at around 20 months - as the next phase of something else begins! LOL But I believe it is part of their nature and brain/mind development. I think all species go through rough periods of development! You probably aren't doing anything wrong, it's just a matter of consistency and reinforcement. Please Google for articles on the web pertaining to the "stages of Aussie development", from birth onward. You'll probably relate. 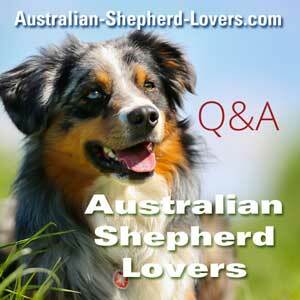 Also, some Aussies are more "herding" driven than others that are bred for "show". The dog I have now definitely CAME FROM A HERDING LINE! Lots of energy nonstop, mentally alert, quick, and physically agile. Hang in there, all will come together in a little time! Smile! Thank you for your response. It gives me hope that come the fall, (20 months) she'll settle down and become more confident. My friend has a 17 month old who has barely had any training at all and she's a happy, friendly, well adjusted dog. Go figure. Nature vs. Nurture? Maybe my nurturing has been a little over the top! Too much training! Hang in there until she goes through her naughty years, it gets better. Focus on consistency, reinforcement, timing, and lots of love - but don't overdo the "lovee" thing! LOL And do not be hard on yourself if she suddenly seems to forget what she's learned! This happens too! Keep positive!